In many cases, decks comprise as much or more surface area than the pools they surround. This explains why replacing a deck or even just resurfacing can cost as much or more than the sum total of the other work involved in a renovation. Therefore, it is critical to know the options you have for dealing with an unsightly or damaged deck. Our experts can present those options, which will be based on the current condition of the deck, how the deck interfaces with structures adjacent to it, and budget considerations. If your decks are in such bad shape that sections are falling away from the pool or damaged beyond remedy, removal and re-pouring will allow you to customize the deck’s finish without using an overlayment. The finish will be a part of the concrete structure of the deck, which gives it more longevity and beauty regardless of the finish you choose. These finishes include a stamped look that mimics stone, textured, hand-carved finishes, and even seeded aggregate for a more rugged look. You can also choose to finish the deck with a stone over concrete or stone over a prepared, non-concrete base. Often, minor cracks and chips in decks can be repaired without a problem. Even some areas of disintegration due to freeze damage can be chipped off of the surface and remedied with cement material. Then, an acrylic overlay can be applied to the entire deck for a uniform finish. These overlays can be a stamped look that mimics stone, textured, or hand-carved finishes, all with your choice of stain color. Any type of deck surface requires some periodic maintenance in order to prevent deep-set stains and provide protection from the elements. Textured and stamped decks particularly need to be power washed at least annually and resealed about once every three years. Whether your deck finish is dated, damaged, hazardous, or painful to bare feet, we can offer solutions that make the most sense for your particular situation. Call us today to schedule a consultation with one of our renovation specialists. 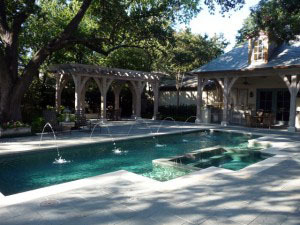 We want to bring new life and beauty to your pool AND its surroundings.